Can God Save My Village? "If God cannot save me and my village from my enemy's attack, I will make idols and worship them." An anonymous vilager (Manipur, India) The introduction of Christianity by missionaries in North-East India, without ignoring the positive contribution, failed to provide a sound theological foundation for the people of this region in their quest for identity and liberation. In this publication, the author, a native of the region, investigates the struggle for identity among the tribal people of North-East India and more particularly the Kuki people of Manipur. Exploring the social, cultural, religious and political changes brought to the people of this region the book highlights their real struggle for justice and dignity. Outlining aspects of the Kuki tradition, as well as dialoguing with Dalit and tribal theology the author proposes possible contributions to a local theology that can help in shaping a new sense of identity for the tribal people of North-East India. 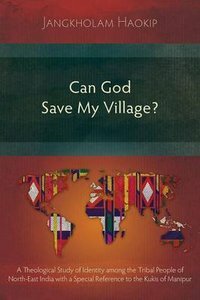 About "Can God Save My Village?"